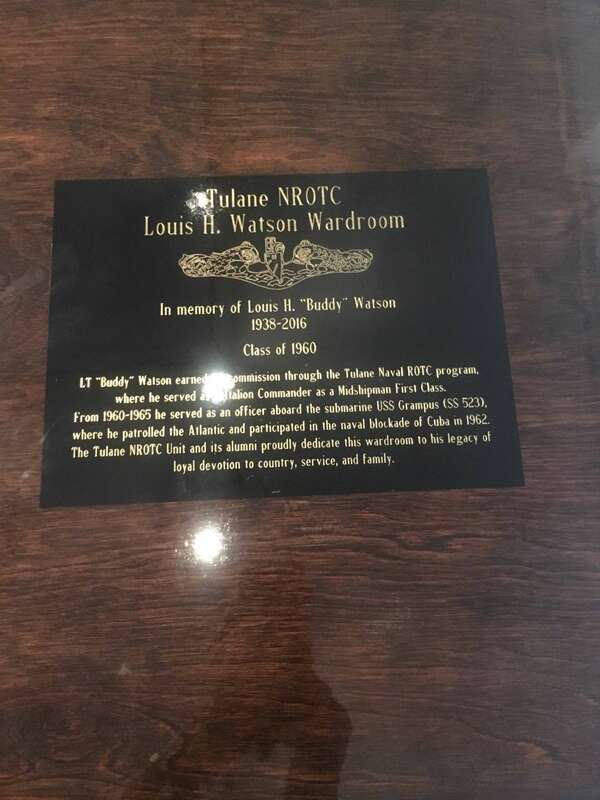 Thanks to the family of Louis Watson (1960) the Wardroom in the Navy ROTC Building received a magnificent facelift. The Unveiling and Ribbon Cutting Ceremony was held on the evening of March 29, 2019 and all lauded the outcome. Larry Tortorich, class of 1978, and father of alumni John (2018) and Michael (2017) attended and expressed his pleasure as “Wow! What an incredible and beautiful Wardroom!” He could not wait to share photos with his sons. The update was made possible due to the generosity of Louis Hanner Watson (deceased), class of 1960, and his family. During his time at Tulane, Mr. Watson was Battalion Commander, a member of Scabbard and Blade, and graduated with a degree in Mathematics. He served in the Naval Submarine force on the USS Grampus (SS-523). After serving, he went on to get his Law Degree from Harvard Law School and eventually moved back to his home state of Mississippi. He married and had three sons. 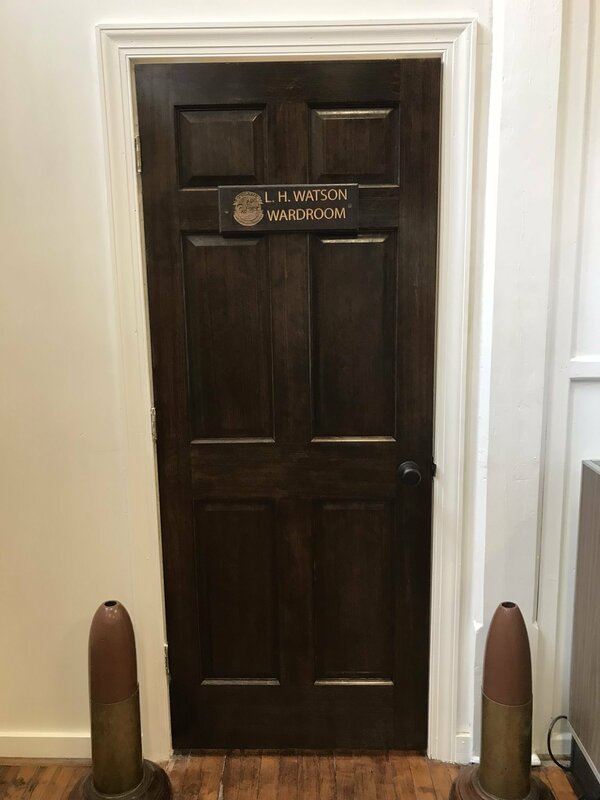 All three of his sons, Louis Hanner Watson, Jr., John Egger Watson, and Benjamin McRae Watson, attended the dedication of the Watson Wardroom. They fondly remembered their father taking them to the campus and the navy building to show them a place that was so special to him. The door to the wardroom proudly proclaims the room as the Watson Wardroom; a plaque on the bar memorializes Mr. Watson, and a model of his submarine is displayed upon the wall. 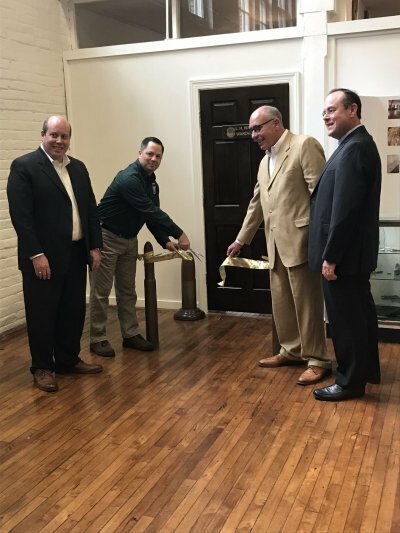 The transformation of the wardroom was made possible with the help of the Alumni Association and the unit staff, especially Master Sergeant Bryan Smith. MSGT Smith did all of the wood-wooding in the room including building the new bar, counter, and tables; over 450 hours of work. He accomplished this monumental task over the break between semesters. For his hard work and dedication, MSGT Smith was awarded the Navy Commendation Medal. MSGT Smith was humble in his acceptance of the decoration saying that it was a group effort for a wonderful program and an exceptional place. Captain Senesky was the proud to show off the new wardroom to all. Current midshipmen, the unit staff, Alumni Board members, Alumni, friends, and family attended the Christening event. Everyone had a wonderful time reminiscing in the newly designed space. Accolades were proclaimed all around and the Watson brothers were thrilled that their father was honored and remembered in a place he loved.